This whitewater shoot of the Numbers Rapids on the Arkansas River near Buena Vista, Colorado is apparently my first editorial shoot since the big iStock / Getty unification project. I’m sure everyone else has already figured out how to do it, but I was really tearing my hair out for a while there! DeepMeta no longer has a check box for editorial so it was a bit difficult to figure out how to do it. Of course it would have been helpful to watch the tutorial for the new interface first, lol… but that’s not how I roll 🙂 Well anyway I finally did watch it and discovered that the editorial submission process has been included at the batch level with the new batch concept implemented by Getty Images. So for those who operate like I do, the answer lies in the creating of the batch. There is a tab on the batch creation window for an editorial batch. Mine haven’t been accepted yet, but the documentation I found indicates that the old rigid caption requirement has been eliminated and that now you just enter the data into the description field. Supposedly the rigid requirements for a format have been relaxed. We will soon find out! River running that is! Most summer days are pretty mild here at almost 9,000 feet at the base of 14,115 foot Pikes Peak. However once in a while it becomes apparent just how close Colorado is to the hot desert land of the southwestern United States. Yesterday was one of those days. I have always wanted to explore the Numbers recreation area between Buena Vista and Leadville during rafting season and when the desert heat started to bake Woodland Park by 8:00 a.m. I decided this was the day! I was getting a bit of a late start, which is a bad thing if you are going to shoot landscapes or wildlife, but for rafting, I figured they wouldn’t really get going until after noon anyway. So I loaded up the doggies for a road trip along with the camera and soon we were rolling west on 24 to the quaint river town of Buena Vista. Once there, the traffic was horrendous, the main road through town was all jacked up with construction cones and I missed my turn down to the river. I know of another access point so I decided to just get the heck out of the mess and go down to the dirt road along the river further north of town. Well that turned out to be fortuitous because I would discover that the Numbers rapids are actually quite a bit further north than I had imagined. I had tried to explore them one other time a couple of years ago, but at the time my truck was not available and with only a Miata to negotiate the dirt roads I was not too successful! From my known access point I turned north on a one lane jeep road until I found a wide place to park. Hiked down to the water where I discovered another photographer working for one of the adventure photo companies. The rapid she was staking out was #4 and I was not too impressed with the vantage point there so after a bit of chit chat I was back out onto the highway looking for the start of the Numbers. Finally I saw a sign for the Numbers Recreation Area and turned in. Another one lane road, probably about 20 miles north of Bueni… soon another sign indicated that the put in was only a mile upstream so I decided I didn’t want to get trapped in river company traffic on that one lane road and went back to the bridge and parked, hoping that there would be a hiking trail along the river. Well there wasn’t exactly a trail on the west side of the Arkansas there, but it is possible to walk along the river and I found a couple of nice spots with a good view of one of the rapids. Not sure which one yet, but it was very close to the beginning of the famed river run. Made my way down to the bank and over a couple of natural rocks steps in the water onto a boulder that was sitting out in the river a bit. Perfect, a seat in the shade, perfect lighting, perfect view of the action and the river upstream! According to the adventure photographer lady, I had about a half hour to kill before the afternoon action was scheduled to begin. Fiddled with my camera a bit to make sure I was going to get good exposures with a shutter speed fast enough for some good stop action. For stock photography, images need to be razor sharp so I wanted shutter speeds of around 1000th and an aperture in the F11 range. A quick check of the histogram indicated that I was going to need to need an exposure bump of a third of a stop. I had seen the rafting companies going in with vans and buses, so I knew there was going to be a good number of rafts coming through soon and right on cue at about 2:00 p.m. the colorful rafts began drifting past, along with a few batches of kayakers. I also decided to try my hand at shooting a video for my Facebook status updates that I was posting… Pretty easy to do with phones these days! I may make it a habit to do that regularly. Only thing I noticed is that the microphone must be in the front because rather than getting the sound of the river I noticed it sounded more like the water gurgling in the rocks behind me. Need to make a note to check into that. Well, by 2:30 the action was dying down considerably already so I decided I had what I came for and let the doggies take a splash in the water at the boat access near the bridge before heading for home. All in all I collected about 200 captures so I will be busy processing these for a while! And I feel confidant that I have thoroughly explored the Numbers and am on to dreaming up a new idea! Today turned out to be a pretty big day, the furthest from home I’ve been in a long time. 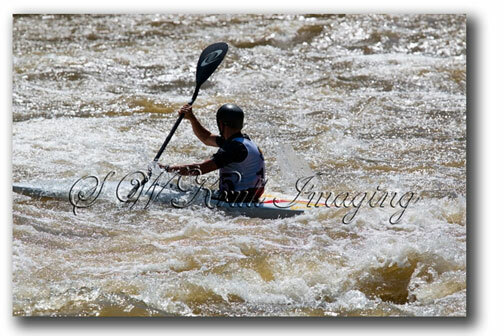 After years of hoping to photograph the Paddlefest whitewater festival in Buena Vista, I finally made it today. I awoke at 5:00 a.m. and it was foggy and cold so I was tempted to just give it up and go back to bed, but I thought it was now or never and just headed out the door. My gear was all packed from the night before because I knew it would be a tough thing to do in the dark in the morning. As I pulled into town I spotted just the thing I was looking for at the moment. My early departure didn’t leave me time to drink my usual morning wake up beverage, so when I saw the Brown Dog Coffee Shop I knew it would be a good place to hang out and wait for the whitewater events to start. Love the place and it will now be my favorite coffee shop west of the Continental Divide! Soon I decided to head on down to the river to find a parking place and scope out the event vantage points. Rain was falling so I was glad that I had brought along my Aquatech rain cover for the camera and a rain poncho. Down by the river tents were being set up with the necessary music and PA gear. I inquired and they told me the main festival was up the trail. Checked that out and decided to head back to the car to wait out the rain and kill the time before the events. 9:00 a.m. finally rolled around so I put the rain cover on the camera and headed back down to the river for the first kayak events at the eddy near the tents. As I was shooting the kayakers, I noticed some mountain bikers on the opposite side of the river high on the ridge, so after the first set I found the bridge and crossed over. According to the maps it looked like the Whipple Trail would afford me a good view of the high peaks to the west. True enough, if it weren’t for so many clouds it would have been awesome. On my way back across the bridge I received my good fortune for the day as a group of paddle boarders were headed down a very scenic segment of the river, all lined up in a very cool row! That will be my money shot for the day I am sure! 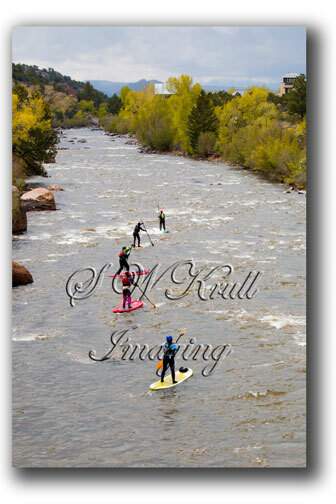 When I got back to the river I got the opportunity to photograph some rafters and the group of paddle boarders were getting ready to tackle some whitewater. A few more captures and I was ready for the drive home, which turned out to be an adventure in itself. It was snowing on the high plains, which is way more excitement than I need when I am driving my summer car. Fortunately I drove out from under the storm and it turned into rain in the lower elevations. Finished up the day with some awesome Japanese Teriyaki chicken and am looking forward to processing almost 300 images and writing an article about the festival for the Examiner. 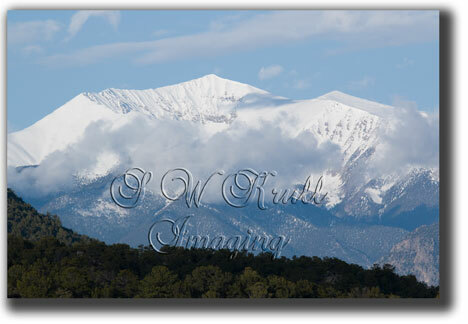 The festival was great and I love Buena Vista and the Collegiate Peaks. I seriously need to think about moving over to that side of the Divide!